This one gets filed away under ‘classic comfort food’. No, it’s not a chicken pot pie and it’s not just ‘chicken and gravy’. It can be quite elegant, actually. 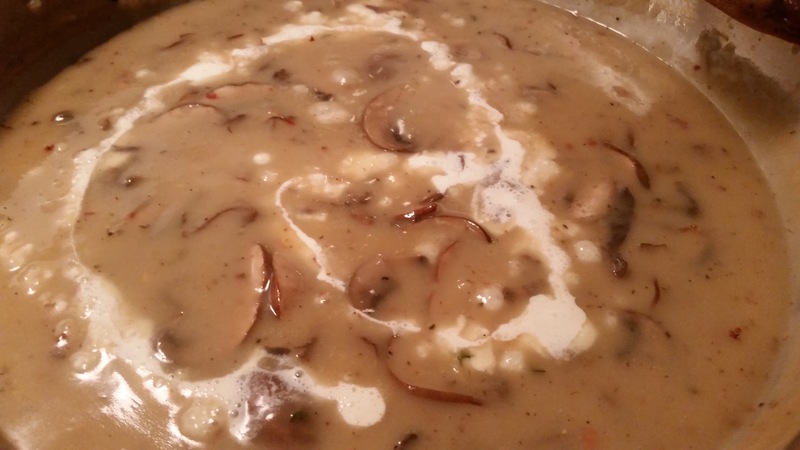 The gravy is silky smooth and packed with flavor. The chicken is poached in a bounty of aromatics and the biscuits? They’re flakey yet dense enough to stand up to flavorful chicken and sauce. Let’s start with the biscuits. They’re similar to a puff pastry, as the dough is laminated. The difference is these are almost scone like. Baking soda and baking powder give them their lift yet they don’t have that awful metallic taste. The butter is partially frozen when added so hands off! This recipe is best made in a food processor. The baking time was a little off. Instead of 10-12 minutes, mine went for 15-18 minutes so keep an eye on them because at 450 degrees, these will go from golden brown to a brick, very quickly. Moving on to the chicken. You could use leftover meat from a roasted chicken but only if it was heavily seasoned. You could bake the chicken, as well, but I really think poaching is the way to go. There are several benefits. The first is that it’s a fantastic way to clean out your produce drawer. Similar to making stock, anything goes. The second benefit to poaching is that you’re able to add sooooo much flavor to what would otherwise be just bland white meat. Lastly, it’s so damn easy….and better for you! 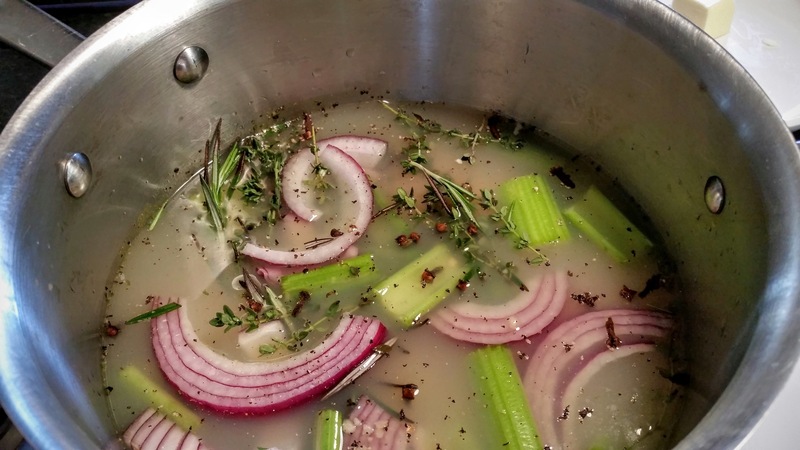 I added onion, celery, chicken broth, (not stock…although that would also work), some white wine, (optional), cloves, peppercorns, and thyme. Like the biscuits, this can all be done ahead of time. Now on to the ‘other’ star of the show, (I’m a sucker for those biscuits)…. I sliced 6 oz of Bella mushrooms. Any kind of mushrooms will do but I tend to avoid those sad pre-sliced white ones. They get sautéed with butter, thyme, salt and pepper, until they’re soft. Once the mushrooms are done, they get set aside and in goes a little more butter to sautée the shallots. Because your going to strain the gravy, there’s no need to surgically dice them. Just slice them and throw them in. Flour is the thickening agen of choice. Be sure to cook it for a few minutes until it gets slightly brown. The sherry (very important) and chicken broth get added and the sauce is simmered for 25-30 minutes. Be sure to stir every few minutes! 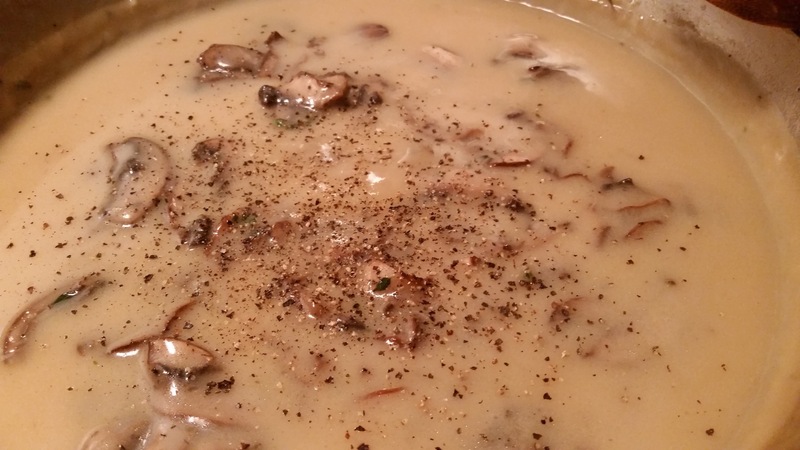 The sauce is strained and the mushrooms rejoin the party. Now it’s time to taste, season and taste again. If you find the sauce too rich, add a bit of cream. Cream solves all the world’s problems. Now the diced chicken returns to the pan to reheat. 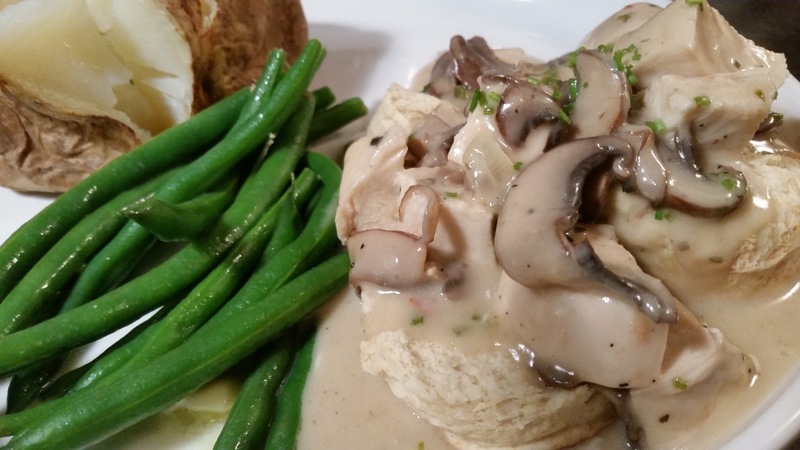 Under that delicious mountain of chicken, mushrooms and gravy, are a few split biscuits that have been warmed. Don’t be intimidated by the following….it looks worthy of a full day of cooking but it’s not because biscuits and chicken can be prepared ahead of time. And obviously store bought puff pastry also tastes great! You can also serve this over rice or yummy egg noodles. 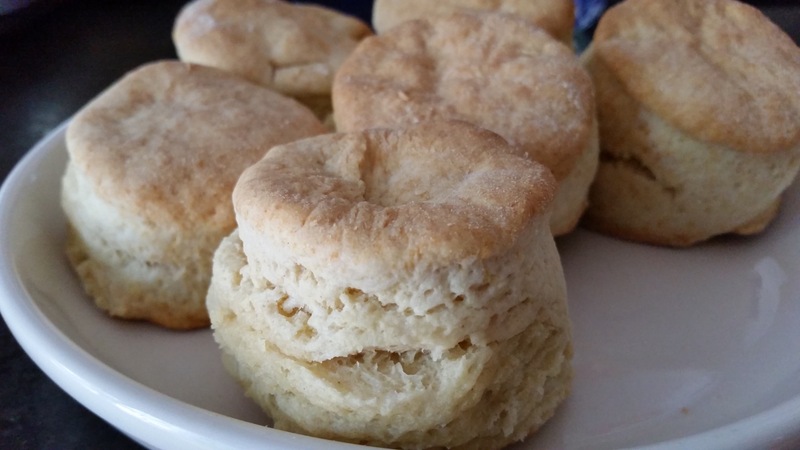 The following biscuit recipe, courtesy of Food.com, makes 6 small biscuits. Next time, I think I’ll double the dough as I prefer larger biscuits. Bake for about 12-15 minutes- the biscuits will be a beautiful light golden brown on top and bottom. 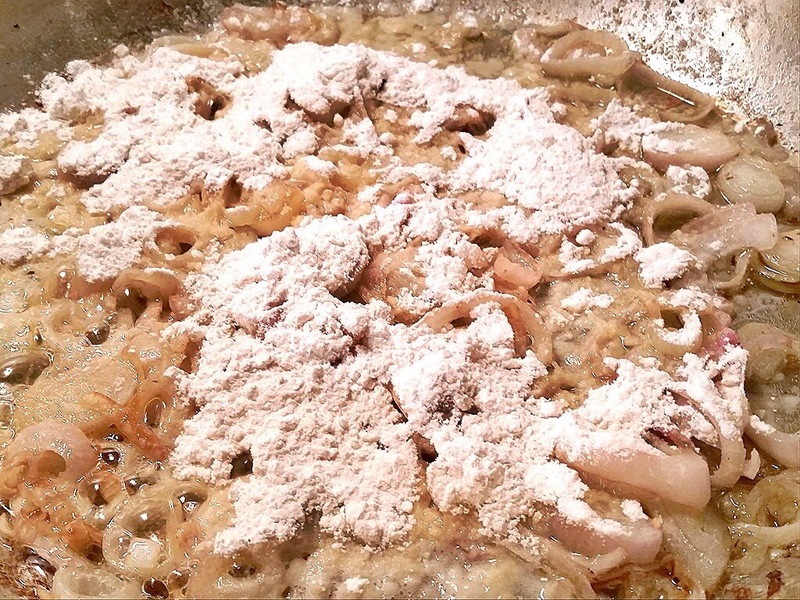 In a 4-6 quart sauce pan, lay the chicken on the bottom of the pan, with overlapping. Season with salt and pepper. Add enough broth to cover the chicken by an inch, add the wine and all the aromatics. Bring to a boil then immediately reduce to low. Cover and let it simmer for 8-10 minutes. The temp should be 170. Check it often, if it still needs more time. You can save the poaching liquid for soups, stews, etc. It will last a day or two in the fridge so I’d recommend freezing it. 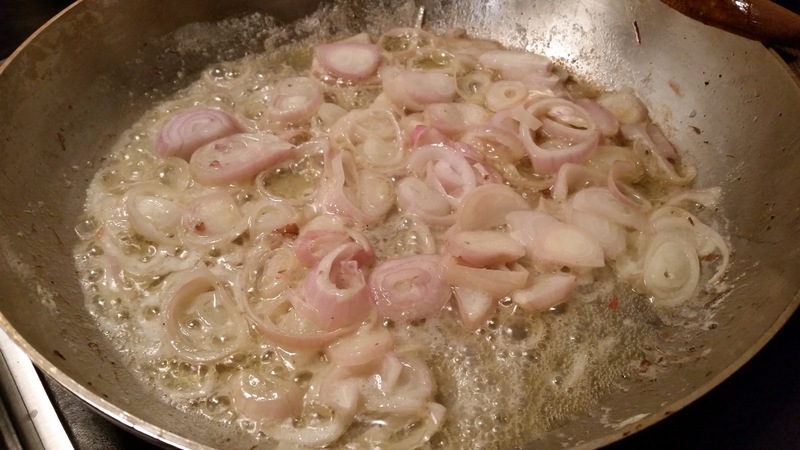 In a large saucepan over medium heat, melt 1/4 cup of the butter, and saute the shallots until softened, about 4 to 5 minutes. Sprinkle in the flour, and cook, stirring with a wooden spoon for 2 minutes. Whisk in the sherry and broth and bring to a boil while stirring. Add the parsley and thyme sprigs, lower the heat to maintain a gentle simmer. Cook the sauce for 30 minutes, stirring frequently. Meanwhile, heat the remaining butter in a large skillet over medium-high heat, saute the mushrooms until golden brown, about 5 minutes. Season with salt and pepper. 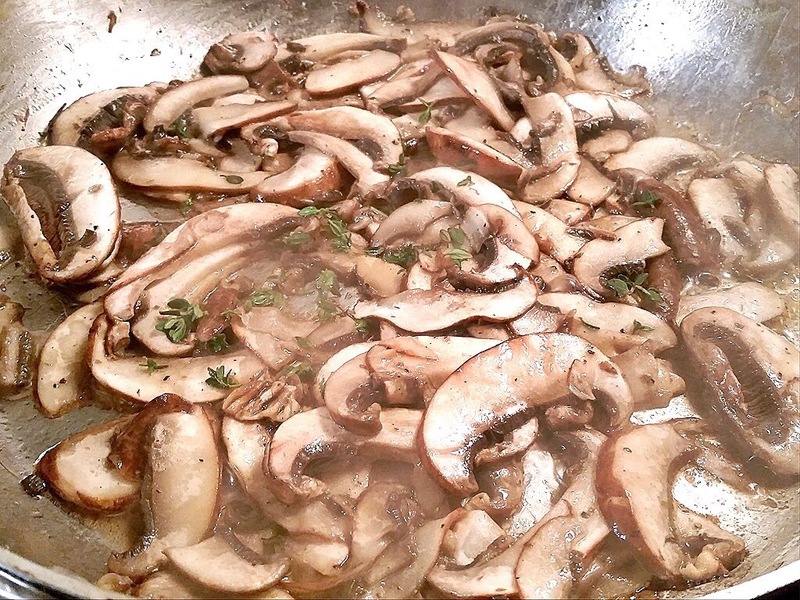 Strain the sauce into mushrooms and season with the salt, pepper, cayenne, and nutmeg. Whisk in the creme fraiche. Add the minced parsley, chicken, and chives to the sauce, and bring to a simmer. Adjust seasoning with salt and pepper. Serve immediately.